1920 Germany's silent landmark classic, director Robert Wiene's The Cabinet of Dr. Caligari (1919, Germ. ), was filmed in 1919 and released in the US in 1920 - it established the movement of German film expressionism. It told about a ghost-like hypnotist-therapist in a carnival named Dr. Caligari (Werner Kraus) who called from a state of sleep his performing somnabulist (and haunted murderer) -- a pale-skinned, lanky, black leotard-wearing Cesare (Conrad Veidt). The shadowy, disturbing, distorted, and dream-nightmarish quality of the macabre and stylistic 'Caligari,' with twisted alleyways, bizarre sets, angular camera angles, lopsided doors, cramped rooms, overhanging buildings, and skewed cityscapes, was shot in a studio. It was brought to Hollywood in the 1920s, and later influenced future literary and cinematic styles, notably the cycle of Universal's classic period of horror films in the 30s and film noir in the 40s - introducing many standard horror film conventions. 1920 Producer John Randolph Bray's (and Bray Picture Corporation's) The Debut of Thomas Cat was the first color (2-color process) cartoon, using the expensive Brewster Natural Color Process (a 2-emulsion color process), an unsuccessful precursor of Technicolor. This was the first animated short genuinely made in color using color film. However, some sources have claimed that the Natural Colour Kinematograph Company's In Gollywog Land (1912, UK) was the earliest, using Kinemacolor. 1920 Co-director Paul Wegener's expressionistic horror film The Golem: How He Came into the World (1920, Germany) (aka Der Golem, Wie er in Die Welt Kam, or The Golem) was the third of a series of films, preceded by two lost films: The Golem (1915, Germ.) (aka Der Golem) and the short comedy The Golem and the Dancing Girl (1917, Germ.) (aka Der Golem und die Tänzerin) - the first known sequel in film history. Due to its ambiguous ending (was the Golem destroyed or not? 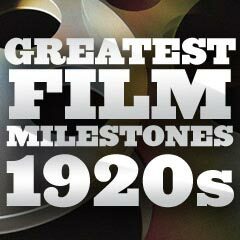 ), the 1920 film has been considered a prequel (the first example of its kind) to Wegener's first Golem film in 1915. 1920 It was the "marriage of the century" when stars Mary Pickford and Douglas Fairbanks, Sr. married in late March, after divorcing their spouses. He bought a lodge for his new bride -- named Pickfair, which soon became the social center of movieland, and served as a gathering place for politicians, journalists, artists, and foreign diplomats. 1920 Douglas Fairbanks, Sr. starred in the popular swashbuckler adventure film, director Fred Niblo's The Mark of Zorro (1920) as the masked swordsman hero - the first of many film versions of the 1919 story "The Curse of Capistrano" by Johnston McCulley. This was Fairbanks' first swashbuckling role (he had previously been a comedian and western star) - a career-defining role that required extreme athleticism for its many stunts. It was one of the first films released through United Artists, recently formed in 1919 by Fairbanks, Chaplin, D.W. Griffith, and Mary Pickford. Fairbanks would go on to star in numerous adaptations of literary adventure tales in the 1920s, such as The Three Musketeers (1921), Robin Hood (1922), The Thief of Bagdad (1924), and The Black Pirate (1926). 1920 Buster Keaton made his first solo film appearance in the comedy short One Week (1920), after co-starring with Roscoe "Fatty" Arbuckle for the three previous years. 1920 Alice Guy, the world's first female filmmaker and a key figure in the development of narrative film, directed her final film, the feature-length Tarnished Reputations (1920). 1920 Black filmmaker Oscar Micheaux' feature-length Within Our Gates (1920) was his earliest surviving directorial effort. Micheaux's first film (a lost film), The Homesteader (1919), starred pioneering African-American actress Evelyn Preer. Micheaux was the first African-American to produce and direct a motion picture feature film. 1920 The discovery of the Kuleshov Effect, by Soviet director and film theorist Lev Kuleshov, served as the basis for Soviet montage-based film-making. It bolstered the idea that film editing (and the contextual sequencing and juxtaposition of various images) was of primary importance in the way that audiences responded to a film's meaning. 1920 Legendary Broadway stage star John Barrymore appeared in the adapted Robert Louis Stevenson tale-horror film, Dr. Jekyll and Mr. Hyde (1920), memorably portraying the two characters of Dr. Henry Jekyll and Edward Hyde. The Famous Players-Lasky production, filmed in Paramount's new Astoria (New York) studio, was one of three film versions of the same 1886 tale in the same year: Dr. Jekyll and Mr. Hyde (1920) with Sheldon Lewis, and F.W. Murnau's Der Januskopf (1920, Germ.) with Conrad Veidt - a lost film. There were four other earlier versions, in 1908, 1910, 1912, and 1913.